Music Reviewer and Internet Publisher Gary Hill has joined the legion of writers who have been inspired by the famous fantasy and horror writer H.P. Lovecraft with his new book The Strange Sound of Cthulhu: Music Inspired by the Writings of H.P. Lovecraft. The Strange Sound of Cthulhu is fourteen chapters devoted to Lovecraft's cult-like following of musicians. Hill, who has written and published thousands of articles on music and musicians, has a special place in his heart for heavy metal and for fantasy. In his book, he has successfully united his two loves, resulting in a fascinating look at Lovecraft’s works and the various songs and albums based on those works. Hill's own book title is based on Lovecraft’s "The Call of Cthulhu," a story about an evil entity who is dead but dreaming and residing in the city of R'lyeh under the Pacific Ocean. With the stage set and the monster in place, Hill embarks on a lengthy journey, which begins with a brief biography of Lovecraft's short, bizarre life, his literary influences, and his first work published in 1906. Hill moves on with a description of the letter writing game Lovecraft and his contemporaries played, that of referring to one another's fictional characters, places and themes. Hill effectively explains how Lovecraft and his fellow friends and writers breathed life into each other’s stories and expanded upon them with their own ideas by pretending they were real and acting as such. Finally, Hill edges into his main topic, that of Lovecraft's influence on music, with references to the scant appearance of music in the author's works. Quotes from H.P. 's letters negate any serious interest in music on his own part. However, Hill demonstrates how those few references have spawned a massive body of work in the music world. Through the use of literary criticism, music reviews, and quotes from musicians, The Strange Sound of Cthulhu demonstrates how the songsters relate to the fantasy world and the timeless questions of the universe. The quotes in The Strange Sound of Cthulhu are lengthy, especially the "Perspective" from Smith from Babyland. However, the ideas have substance, and the writing is solid. The book goes in depth to discuss Lovecraft’s influence on the various genres of rock including psychedelic; progressive; heavy metal; death metal; goth; and punk. Hill’s coverage is excellent, his comparisons and references are apt, and his knowledge of the subject matter is thorough. He gives a rundown of the most notably-influenced bands beginning with the ones named after the writer, such as “H.P. Lovecraft,” whose band members give conflicting accounts of how the band’s name was chosen. Hill examines the music and the lyrics in two songs the band wrote that were directly inspired by the author: “The White Ship” and “At the Mountains of Madness.” Major bands discussed are both Lovecrafts, one a band that developed from “H.P. Lovecraft” and the other a band of the same name from Argentina; Halloween (the band that released an album devoted to Lovecraftian themes (Laz, released in 1980); and Rage. The story continues with comparisons of the works of bands from all over the globe including Djam Karet; Payne's Gray; Metallica; Manilla Road; Bal-Sagoth; Mekong Delta; Dream Death; Repulsion; Necrophagia; Rigor Mortis; Celtic Frost; Solitude Aeturnus; Morbid Angel; Thergothon; Rudimentary Peni; Cassandra Complex; Fields of the Nephilim; Morphine Angel; Asmodeous X (this band has a Lovecraft-inspired CD slated for release); and Cradle of Filth. After the overview, Hill signals the end of coverage of music genres and devotes individual chapters to artists with the strongest connections between Lovecraft's works and their own, such as Oliver Taranczewski (from goth groups Evil's Toy and T.O.Y.) and goth rockers Nox Arcana. The highlight of the book, though, is when Hill defends the macabre themes, band names and song titles that have shocked the general public for generations. The explanations of their foundations in Lovecraft’s fantasy world makes clearer the musicians’ intentions. Hill’s coverage of dissonant compositions such as Rudimentary Peni’s “Sarcophagus” and horrific song titles such as “Imprisoned with the Pharaohs,” aid in revealing the direct influence of Lovecraft’s works. Hill also reveals that, for many readers of mythology and an ancient literary world filled with demons, mystical journeys, magical worlds, and monster-slaying heroes, music has become a natural extension of the places, times and characters Lovecraft and his contemporaries created. As a professional music reviewer, Gary Hill has a firm grasp of the material, and he is honest and clear in relating his impressions of the music. His vocabulary is impressive, and The Strange Sound of Cthulhu is academically sound. 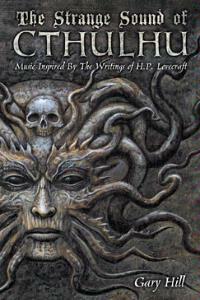 It is an excellent read for fantasy fans, music lovers, and Lovecraft followers. With a foreword by S.T. Joshi, who wrote the highly-acclaimed H.P. Lovecraft: A Life, the book is sure to make its way into the hands of many of the musicians mentioned in the book.